You couldn’t ask for more at a Bed and Breakfast. Jodi and Christian are perfect hosts. We never felt like we were in their home. We felt at home. In the morning we had breakfast which they made for us, and then would go out exploring the area for the day. They always had great suggestions specific to the kinds of things we wanted to do. When we were out all day I remember thinking….”When we get ‘home’….” as if their house and my feeling of home were one and the same. We enjoyed a fantastic dinner together, which they made and served. We asked them to join us and they did!! It was so much fun getting to know them and exchange stories. On some mornings we helped feed the sheep, donkeys, and the horse. And one day we even helped their son wrangle one of the small lambs which got loose. While there, we were able to go running in the mornings, hiking in the afternoon, and we spent one night at a great bar/restaurant called the Oarsman in Carrick-on-Shannon. The food was delicious! The only regret my husband has, is that he didn’t go fishing for pike with Christian and his son. From Ballaghboy it is very easy to get around. Sligo, Boyle, and Carrick-on-Shannon are close by and great towns to check out. My husband took an easy ride early one morning and stopped by Easkey to follow up on some genealogy research. He was back by the time I finished a morning hike, checking out the Bluebells with Jodi. 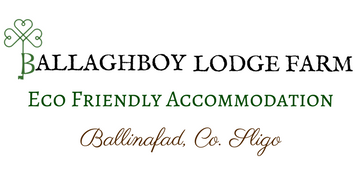 We can’t say enough about our time at Ballaghboy. And we can’t wait to go back, and hopefully bring some more family members! First on the list, my husband says, when we get there, is to catch some fish! Jodi and Christian have created a truly lovely and deeply comfortable atmosphere. The food is fabulous, beds super comfy and beautiful grounds to explore. All this situated in the most fascinating and beautiful region of Ireland. Ballaghboy Lodge Farm has intense beauty and serenity. Jodi, Christian and Tristan are full of passion and long to share it all.